Just a quick note to say I’ve got reviews in both The Australian and The Sydney Morning Herald this weekend. The first, in The Australian, is of Michael Cunningham’s rather underwhelming new novel, By Nightfall. As someone who admires a lot of Cunningham’s work (especially his last book, the gloriously weird Specimen Days) I wanted to like By Nightfall more than I did, but in the end it’s just too finely wrought and exquisitely felt to ever quite come to life. The second, in The Sydney Morning Herald, is of China Miéville’s Kraken. Some of you may have seen my review of the nominations for the 2010 Hugo Award for Best Novel a few weeks back, which talked a bit about Miéville’s last book, The City And The City, which went on to share the Hugo with Paolo Bacigalupi’s The Windup Girl. As I said in that review one of the things that’s fascinating about The City And The City is how thoroughly it expunges the glitter of Miéville’s earlier work, and in that sense Kraken reads like a return to more familiar territory for Miéville (if a writer as restlessly imaginative as Miéville could ever be said to have a “territory” in any meaningful sense). 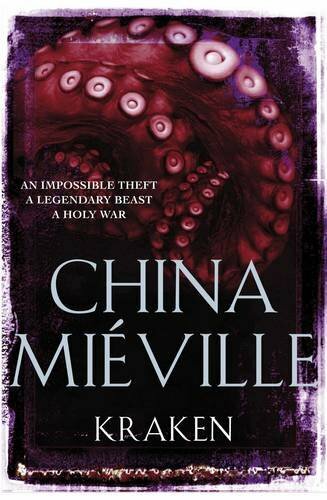 But it’s also a much more light-hearted and playful book than many of Miéville’s earlier books, a quality which is oddly disarming at first but which (at least to my mind) means the book never seems prepared to fully commit to its own existence in some deep sense. ← You know how there are bad days and really bad days? Your last sentence waxes metaphysical. What book does? Thank you, though I’m sorry if it’s proving difficult to subscribe. You should be able to use the RSS Link in the top right corner and subscribe to Posts, and I tweet posts as I make them as well, so you could also follow me on Twitter (@cityoftongues) and you’ll get updated there. Hope that helps . . .
Liz from San Francisco’s PBS affiliate, KQED, just dropped me a line to say Cunningham recently read a passage from By Nightfall on their weekly reading show, The Writer’s Block. The audio is available on the Writer’s Block website.